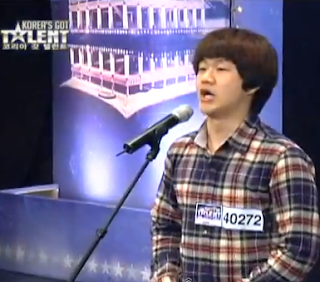 21-year-old Choi Sung-Bong blew away the judges and audience when he appeared on "Korea's Got Talent" with not just his singing, but his powerful story as well. Between being orphaned at age three and running away from orphanage because of abuse at age five, Choi has never had an easy life. For the next 10 years after running away, he lived on the streets, surviving by selling gum and drinks. He slept in night-club stairwells or public toilets with only a few layers of clothes to keep him warm during Korea's harsh winters. When asked what continued his will to live and what gave him comfort he responds by saying it was music. Choi says he "felt calm when he listened to music…music was my only friend when I was lonely." After hearing an opera-style singer in one night-club, he knew what he wanted to. After much searching, he found former opera singer Park Jung-So. Park began training him free of charge and helped him pass the state examination so he could attend an arts high school at age 16. Through a children's foundation, Child Fund Korea, Choi was able to have a place of his own, a government subsidized place. After coming in second place on "Korea's Got Talent," Choi says he now has something to live for and he hopes his music can help others the way it helped him. To learn more about inspiring people and Asian culture, please visit Fujimini Island, find Fujimini Island on Facebook, follow Fujimini Island on Twitter. K-pop continues to sweep the world with fans from many countries tuning in. The Korean wave has expanded far beyond Asia, reaching to countries including England and now the United States. This explosion of popularity has served to be an effective bridge-builder between U.S. and Korean culture. In response to last year's K-pop concert in Paris, drawing fans from all over Europe, American fans requested that concerts be held in the U.S. K-pop stars are capitalizing on their popularity by embracing the trends of the younger generation. K-pop concerts are now available to watch on YouTube, being viewed nearly 2.3 billion times in 235 countries. Recently, the K-pop group Girls' Generation appeared on three major U.S. TV talk shows, "Late Show with David Letterman," "Live with Kelly," and NBC's "Extra TV." K-pop will undoubtably continue to flourish and gain popularity due to the unique combination of exceptional singing, trendy dancing, and nice appearances K-pop artists and groups possess. Ivy, who nearly disappeared from the public scene since her 2009 album, may be making a comeback this year in K-pop. Besides her appearance in the musical "Kiss Me Kate" in 2010 she has stayed away from the music industry for over two years now. A reason for her withdrawal in the industry is largely due to a legal dispute with her former agency, Storm ENF. Previous to her disappearance she won numerous awards including SBS Best Female Singer Award at the "2005 Ga Yo Doe Jun" and Mnet's Best Female Solo Artist in 2007. Hopefully this 2012 she will be back on the K-pop scene. To learn more about K-Pop and other Asian themes, please visit Fujimini Island, find Fujimini Island on Facebook, follow Fujimini Island on Twitter. Hyun Bin, a South Korean actor best known for films such as Secret Garden, is currently enlisted in the military and serving in the Marine Corps. He has been in military service since early March 2011 and has been assigned to a camp in Baek Ryung Do. 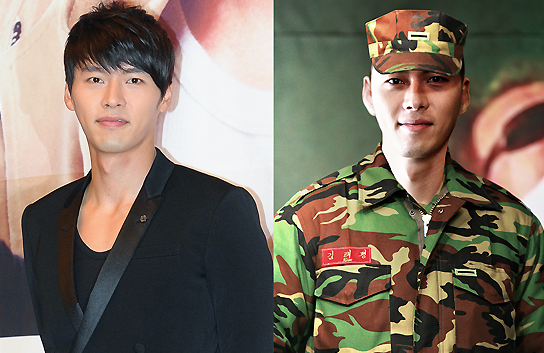 A photo of Hyun Bin with a fellow soldier in camouflage uniform has recently surfaced online. Viewers have noticed his sleek, handsome appearance with his new dignified posture. The photo received many comments such as "Come back! I want to see him soon!" and "Please take care in the cold" by fans. To learn more about The Year of the Dragon and other Asian themes, please visit Fujimini Island, find Fujimini Island on Facebook, follow Fujimini Island on Twitter.